Susan Svirsky submitted this photo. This Phantom Regiment photo was taken at the San Diego show on Aug. 5, 2007. 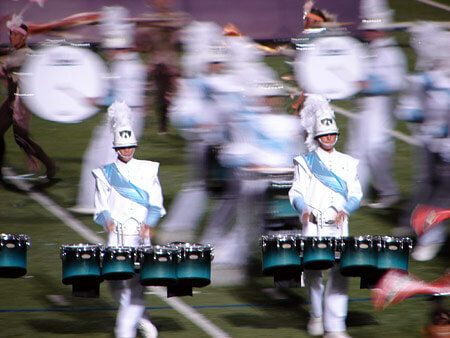 The tenor drummers are frozen in time while the rest of the corps is a blur behind them. I have a daughter who was a 2007 member of Phantom Regiment (a marimba player) and also marched as a member of Teal Sound for two years.